A Pastor is considering divorcing his wife upon discovering that ‘his children’ don’t belong to him, after DNA tests were being conducted on them. In his narration, the man revealed that he had an accident years ago before meeting his wife and he was told it would only take a miracle for him to father a child. Surprisingly, years into their marriage, his wife gave birth to their 1st child and then the 2nd and then the 3rd. But after DNA tests were done on the three children, it was revealed that they belong to another man, though his wife is not aware of this. I have been married for 14years, we have 3kids (all boys) but none of them belongs to me. I know this for a fact but my wife does not know I know. Let me explain. 5years before I met my wife, I was involved in a car accident together with two of my friends. We were travelling and our car skidded off the road. I was the only survivor of that accident. l spent about 11months at the hospital and that left me with a condition that says I can’t have children. I gave my life to Jesus Christ and become a committed Christian after the accident. In summary, I became a pastor in a local church in my community 5years later, I met my wife in the process. I didn’t tell her about my condition because I was hopeful that God will heal me. Six years into our marriage my wife got pregnant and had our first child. To be sure, I secretly went for a DNA and it was clear I wasn’t the father. I repeated the test for all the 3 children and they are all not mine. I have been living with this situation for the past 8 years and I am beginning to get irritated by both the children and my wife. l am just angry and irritated by everyone in my house lately. I feel like a total stranger in my own home. The State House of Assembly has passed a bill for a law to control burial and funeral ceremonial activities in Anambra State. The bill which is sponsored by Honourable Charles Ezeani, representing Anaocha Two Constitiency was passed during yesterday’s plenary after it was considered at the committee of the whole. The Anambra State Burial and Funeral Ceremonial Activities Bill is aimed at cutting down the cost of burial activities in the state. The bill provides that in the event of death, no person shall deposit any corps at the mortuary or any other place beyond two months from the date of demise, while burial ceremonies in the state shall be for one day. It further stipulates that during burial and funeral ceremonial activities, the family of the deceased shall provide food for their kindred, relatives and other sympathizers at their own discretion. The bill places ban on destruction of property, gun shots, praise singing, blocking of roads and streets during burial ceremony in the state as defaulters shall be punished according to the law. It made it clear that from the commencement of the law, no person shall subject any relation of the deceased person to a mourning period of more than one week from the date of burial ceremony. Speaking on the Bill, the sponsor, Honourable Ezeani revealed that the Bill also put in place a monitoring and implementation committee that will enforce the law as well as their responsibilities. On his part, the Deputy Speaker, Sir Hafford Oseke described the bill as à welcome development as it has put to rest high cost of burial and ceremonial activities in the state. Speaker of the House, Mrs. Rita Maduagwu commended the lawmakers for passing a bill that will arrest unnecessary burial expenses in Anambra State. President Muhammadu Buhari and the Spiritual Director of the Adoration Ministry, Enugu, Reverend Father Ejike Mbaka are in a closed doors meeting at the State House Villa, Abuja. 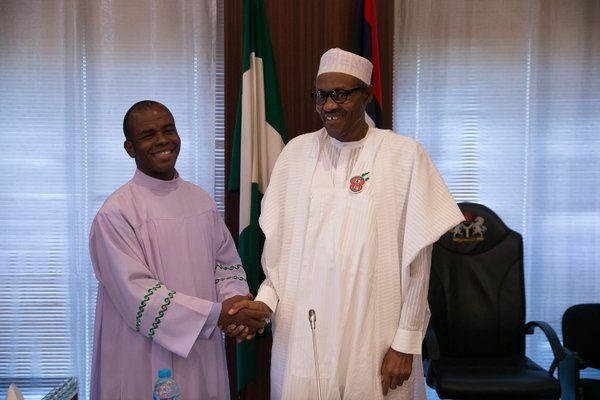 Mbaka arrived the forecourt of the president’s office at about 12 noon and went straight to the president’s office. 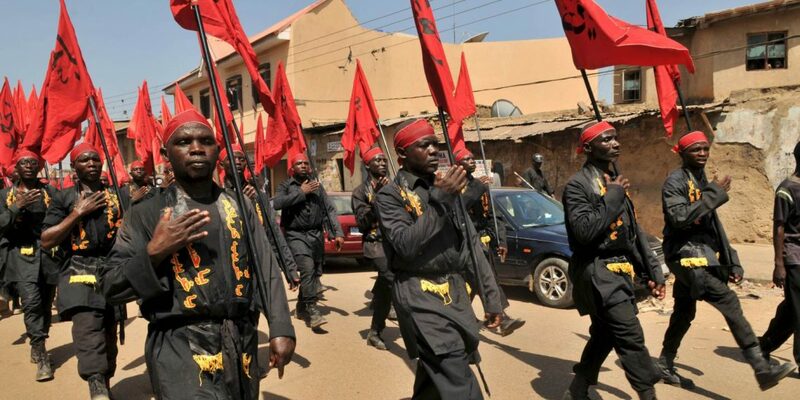 The Nigerian Army has alerted of the emergence of another deadly Islamic sect known as “Hakika Islamic.” The army said the group has strange doctrines similar to that of Boko Haram. The sect, according to the army, is headed by one Yahaya Ibrahim and is currently recruiting young men and women; with operational bases around Ngwurore, in Yola South Local Government Area of Adamawa State and Toto Local Government Area of Nasarawa State. Giving more insight into the activities of the sect, the army said the group has controversial doctrines. The sect, which is said to have been in existence for sometime now, according to Daily Sun sources, was beginning to give army authorities fighting counter-insurgency war in the North East big concern. It was also gathered that already, the army authorities in Borno State have contacted the Nigerian Immigration Service (NIS); to inform them about the existence of the sect. Army informed the NIS in a July 4, 2018 letter. The said letter, with reference number 192 BN/G3/240/57, was signed by one Lieutenant TG Iortyom on behalf of the Acting Commanding Officer in charge of 192 Battalion in Borno. The letter, made available to Daily Sun, reads: “I am directed to connect security report from own high command and to inform you that information received that an Islamic Sect known as “Hakika” under the leadership of one Yahaya Ibrahim has emerged around Ngwurore in Yola South LGA of Adamawa State and Toto LGA of Nasarawa state. When contacted, the Director of Defence Information, Brigadier General John Agim, confirmed the report and added that the military is already on top of the situation. A Kenyan town, Narok County, has banned churches from holding vigils as authorities say churches are to blame for the rising statistics of early pregnancies among teenagers in the area. The County Commissioner, George Natembeya, issued the ban on night prayers after linking them to early motherhood. He told Citizen TV that in March 2018, 17 girls from Suswa Girls Secondary School in Narok County were found to be pregnant. The same town, in 2004 suspended street preaching unless sanctioned by police. Natembeya’s directive has led to mixed reactions from the people, while some believe the government was right to protect young girls, others felt the directive infringed on their right to worship. “Narok Pastors kindly plan a ‘Kesha’ (popular word used to refer to night prayers) at the Narok stadium and invite the county commissioner. This is one of the many ways of fighting Christ, but GOD is able in fighting his wars, have an eye on this, the one who banned ‘Kesha’ prayers will not be the one to uplift the ban,” Nicholas Muendo, a resident of Machakos who spoke with Uganda Christian News. James Ndiga said, “I started attending night prayers in my teens and have never heard people getting babies in the morning, the only place Kenyans feel more secure is in the church.